Jan's hosting at Little Red Wagon this week and she's calling out "Hello, Sweetie"! She's challenging us to anything sweet on our projects - from a sweet treat to something that makes us think "Oh! That's so sweet!" to the word sweet itself. I must have been a bit hungry when I decided on my take for the challenge and went with a sweet treat. Please check out the rest of the projects at Little Red Wagon and then link up your own sweet creation! Super cute (and sweet) card, Kate! I could go for a cupcake right now. (: Love the sentiment too. Your card is so cute Kate! 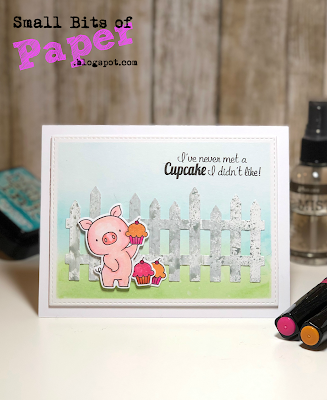 Love the sweet piggy! Me neither LOL. Love your adorable card Kate. I see sweet treat and also said awwwww to that cute piggy! Such a sweet, sweet card! Cute little piggy, Kate and great scene !